GOLD PATRON TICKETS ARE SOLD OUT! Silver Patron and General Admission tickets are still available through House of Blues by visiting HOB.com/NewOrleans or by calling 504 310 4999. The NOCCA Institute, The New Orleans Advocate, and the family of Daniel Price invite you to Home for the Holidays at House of Blues New Orleans, 225 Decatur Street, on Friday, December 21, 2018. Home for the Holidays is a night of spectacular art and music benefiting the Daniel Price Memorial Fund for Aspiring Artists, which honors the memory of NOCCA alumnus Daniel Price. In keeping with Daniel’s twin passions of art and music, the Fund provides scholarships for outstanding visual arts and music students at NOCCA. Home for the Holidays kicks off with a patron party from 6:30pm – 8:00pm. 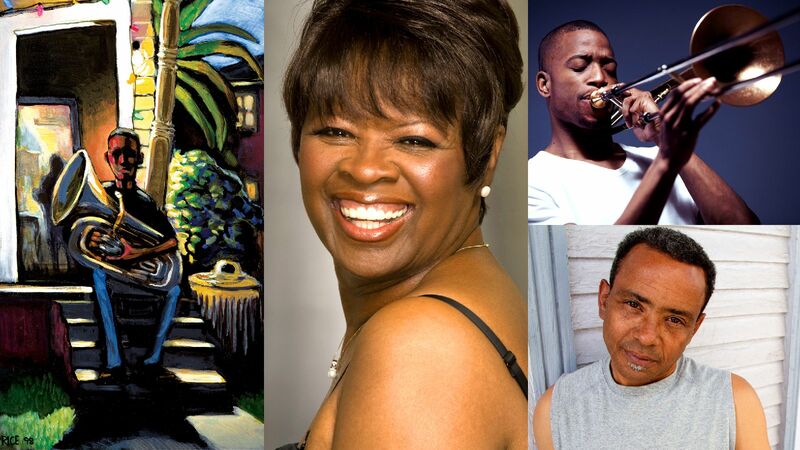 Both Silver- and Gold-level patrons will be treated to a concert by the legendary Irma Thomas and John Boutte in the concert hall. As a special perk, our 80 Gold-level patrons will receive reserved seating in the House of Blues loge, which offers an unobstructed view of the stage. Patrons will have accesss to the Parish Room, where there will be an open bar from 8pm until the end of the Home for the Holidays concert. Patrons will also be welcome in the Foundation Room. Gold and Silver level patrons will be admitted through the Foundation Room entrance, beginning at 6:30pm. Patron tickets are $145 for Silver-level and $290 for Gold-level. Please see below for ticket information. The party continues from 8:00pm – midnight with the official Home for the Holidays concert, featuring performances by Trombone Shorty and Friends, the Preservation Hall Band, Water Seed, Ivan Neville and Friends, New Breeds Brass Band, and James Andrews, with emcee Gralen Banks. General admission tickets to the concert are $45. House of Blues will sell “fest food” all night long in the main hall to keep guests fueled up! The general admission entrance is located by the House of Blues restaurant and bar. Doors open at 8:00pm. To purchase Silver-level and general admission tickets, or for additional information, please visit HOB.com/NewOrleans or call 504 310 4999. To purchase Gold-level tickets, please fill out the registration form below. Please contact Sarah Stickney Murphy at smurphy@noccainstitute.com if you have any questions about Gold-level tickets. Please note: Because Gold and Silver Patron tickets include access to an open bar, Gold and Silver Patron attendees must be over 21 and will be required to show identification when entering House of Blues. General Admission guests must be over 18. If you are unable to join us at the House of Blues, but would like to make a donation in support of Home for the Holidays and the Daniel Price Fund for Aspiring Artists, you may do so here.